The Fosselman’s offer more than 200 ice cream flavors. Taro is one of the most popular. Chris and John Fosselman hoist ice cream flavors — mango, salty caramel, vanilla, coffee — into four mixers and wait for the churn before hand-packing buckets with their crew. 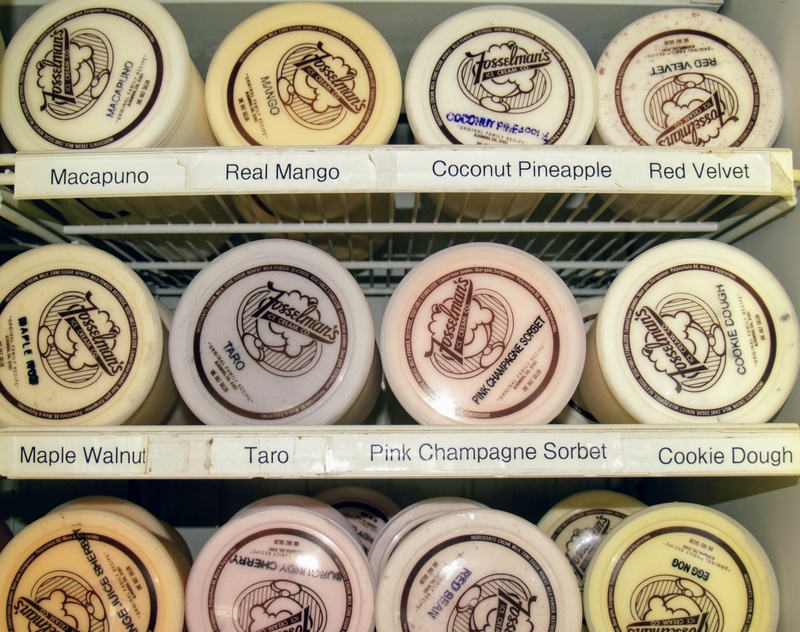 At Fosselman’s Ice Cream in Alhambra, the family-run operation is streamlined, producing 200-plus flavors for the retail store and wholesale operation on Main Street. The brothers are the third generation of Fosselmans to run the nearly century-old business, turning their grandfather’s California dream that he brought from Waverly, Iowa in 1924, into their own. For families with generations in California, the dream evolves. For those who are new — like Asian and Latino immigrants who have been arriving in greater numbers since the 1970s — the dream also is evolutionary. What, if anything, does it mean for the California dream when the population changes? Despite generational and cultural differences most people seek a version of the same dream, said Bill Deverell, University of Southern California historian. For the Fosselmans, the move to California made sense. The brothers now have their version of the California dream going, seeded by the work of their grandfather, father and uncles. They have embraced the community as it has changed, while keeping the same recipe for ice cream — heavy on the buttercream and low on fillers — that makes them successful. In this city about 10 miles outside of downtown Los Angeles, in the San Gabriel Valley, the population has shifted from majority white. The city is 54 percent Asian and 34 percent Latino, according to the 2016 Census American Community Survey. Asians are the fastest growing group of immigrants and are expected to exceed Latino immigrants in the U.S. within five decades, according to a Pew Research report. Between 2000 and 2015, the Asian population grew 72 percent with Chinese, Indian and Filipino making up the largest nationalities. California is home to about one-third of the Asian population in the U.S.. The perspective on the dream appears to shift the longer a family has been in the state, especially among baby boomers. They worry that the new generation is doing worse than they were and that their children may not be able to be as successful. A recent USC Dornsife/Los Angeles Times poll found that 50 percent of Californians believe younger residents are doing worse. While cost of living is rising, the middle class is shrinking, wages have remained relatively stagnant and housing prices have skyrocketed, many Californians are still optimistic about the dream for them and their children. That includes the Fosselman brothers, who feel they’ve achieved their version of the dream. They bought into the business nearly three decades ago, purchased homes in Pasadena, have families and have grown the business every year. “I’ve already reached my dream a long time ago, I had a very small goal, I wanted to have a really nice family, a nice roof over my head and make a good product and help make my kids happy; and I’ve done that. I reached it. I don’t have giant expectations,” said Chris, 52. Chris Fosselman, forefront, pours salted caramel into a bucket to use in a mixer. John, center back, coordinates the hand packing with other staff members. So just doing what the family has always done isn’t the way the Fosselmans have pursued their dream. “Maybe the rebirth for Chris and I with the California Dream really has been the kind of the influx of new people and new immigrants to the area that didn't have anybody there that was making that product for them,” John said. In the late ’80s with the help of community members, Fosselman’s began producing different kinds of ice cream for the newcomers. Flavors large producers would never make for burgeoning ethnic groups. The new menu didn’t happen by accident. Community members came to Fosselman’s to request them for their restaurants and businesses. The brothers said yes. They recognized an opportunity to serve the changing population. What they’ve come to know is that while the immigrants may have entirely different backgrounds, their dreams are similar. They want opportunities, jobs, good education and better lives for their children. About five minutes away at the annual Chinese New Year Festival another prominent Alhambran — Pinki Chen — made the rounds talking to long-time vendors, fire department representatives and children dressed up as dogs ready to go on stage after the dragon dancers. “Hello, hello,” she called out to people she recognized. Chen ran the festival for 20 years until retiring last year. 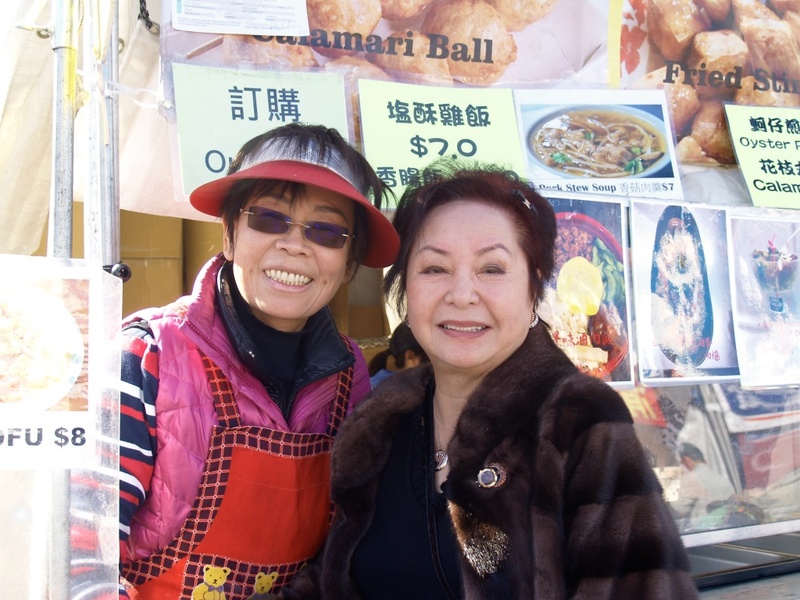 Pinki Chen made the rounds at the recent Chinese New Year festival, greeting long-time vendors she worked with for the two decades she ran the celebration. Chen arrived in the city in 1980 from Taiwan, after a few years in Boston to attend college. California was the land of opportunity, she said, and great weather. Plus the growing Asian community made it easy for her to move West. Her vision of California was directly influenced by the western television programs she watched as a child in Taiwan. “I remember watching a lot of the wagon trains coming into the West, the pioneer and also finding the gold,” she said. In California, she found her version of that dream — a career, a family and a house. She started as a language instructor and, like the Fosselman brothers, reinvented herself over and over. Chen became a Realtor and later a real estate developer. When she saw the market starting to slow she knew she had to find something else. Around that time she was asked to serve on the New Year Festival committee. She was first a volunteer but eventually took it over as full-time executive director for two decades. She did all of this while raising two daughters with her late husband in San Marino, one of California’s wealthiest cities. Like the Fosselmans, Chen agrees the dream may be harder to attain these days. But she’s still a believer. Whether you’re reinventing ice cream flavors or a career, California is a place where residents can evolve, which is something that still attracts people today. Correction: An earlier version of this story misstated the university historian Bill Deverell works at. KPCC regrets the error.